SocialExpress, a social media reporting company, has raised €250K in seed capital from hot European investors. The one-year-old startup has developed a cloud-based service for social media managers to report insights about conversations – picked up from Facebook and Twitter – efficiently to all stakeholders within their company. With SocialExpress, social media managers can build visually appealing reports with the ease of drag-and-drop functionality, unlike existing complex reporting processes. The platform pulls data from social networks and also integrates with existing social CRM platforms. Since each department within a large company has different needs and KPIs, it takes significant time for social media managers to build custom reports that satisfy multiple internal stakeholders. 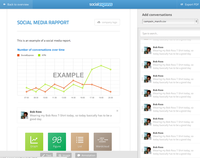 SocialExpress changes this labor-intensive reporting process into a pleasure. SocialExpress' pilot customers include ABN AMRO, the major Dutch bank. The investment round is the second token of appreciation for the company. The one- year-old startup was already selected out of 400 startups worldwide to participate in Startup Bootcamp Amsterdam, the leading European startup accelerator. SocialExpress is led by Ivo Minjauw, a 24-year-old Belgian, who started off one year ago building the company in his dorm room in Kortrijk. SocialExpress has chosen its investors for their knowledge and background in SaaS.The company will invest the capital in product and business development.